Correction: Danny Baldwin notes below that Men in Black 3 was actually shot on film, not with 3D cameras, but it was still designed with a 3D conversion in mind. 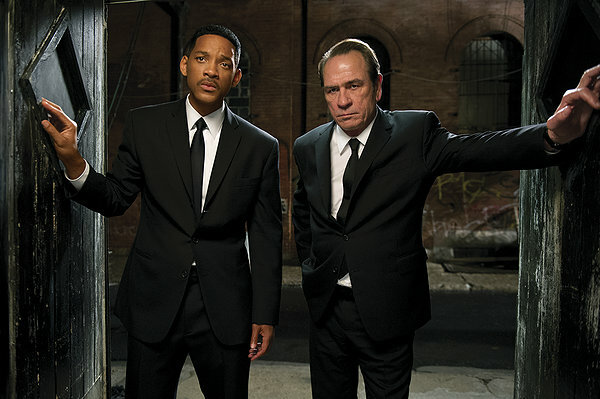 I don’t plan on writing a full review of Men in Black 3, the painfully dull sequel to the Will Smith franchise. 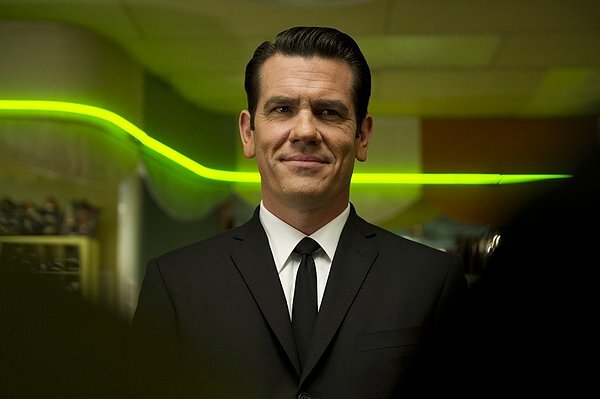 The film is rarely inventive and quite laborious, and even the quite awesome Josh Brolin is only so fun as a young Tommy Lee Jones (who seems to have only shown up for a paycheck). The film’s saving grace is actually Michael Stuhlbarg as a being who can see across alternate timelines (useful for watching Mets games, it turns out). But besides the lazy script, there was something extremely alarming about Men in Black 3: the flat compositions. Being a hater of 3D in almost every possible situation (sans Pina), I ended up seeing the film in 2D (and in 35mm no less!). This is not the first time I’ve seen a 3D film in my preferred format, but it is the first time I’ve noted that choosing to see the film in 2D was actually a detriment to the film. A shot clearly designed to make the model and Smith pop out. 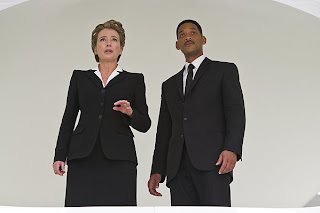 You see, Men in Black 3 was filmed with 3D compositions in mind. So, director Barry Sonnenfeld was a specific way of composing his shots, specifically push everything to a flat line in the foreground, and keep it centered so it can pop out more. As you can see in some of the shots I’ve provided, Sonnenfeld keeps to this tactic almost throughout the film. 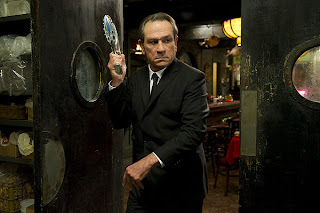 Instead of pushing characters into interesting dynamics within the shots, almost every dialogue sequence in Men in Black 3 is done in a centered medium shot. If I saw the film in 3D, then this popping effect might give the film's visuals a little more wit. But seeing it in 2D, these compositions were flat, and even worse, boring. 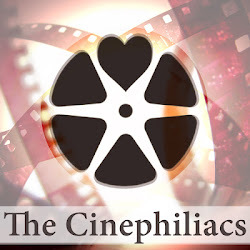 A great example of the film ignoring its negative space. 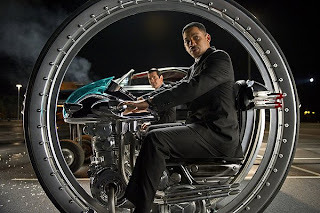 If you are wondering why 3D is such a dangerous issue for filmmaking, the example of Men in Black 3 is a perfect example of the craft not becoming lazy, but because directors are being limited in their creativity. Sure, perhaps some would argue Martin Scorsese proved that wrong in Hugo, but not every director is a Scorsese. 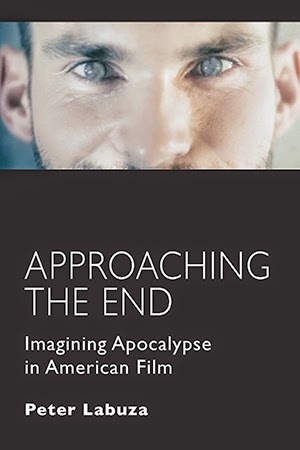 Soon, filmmakers will stop thinking about the power/desires/wants of their characters and how they can express those ideas visually, and start thinking about how the shot will best look when projected in 3D. The point, after all, will be to make the most out of your 3D, not out of your characters. Perhaps if 3D becomes a standard (*shudders*) like wide screen, the more familiar filmmakers become with the format, the better they’ll be at using it to tell stories visually. 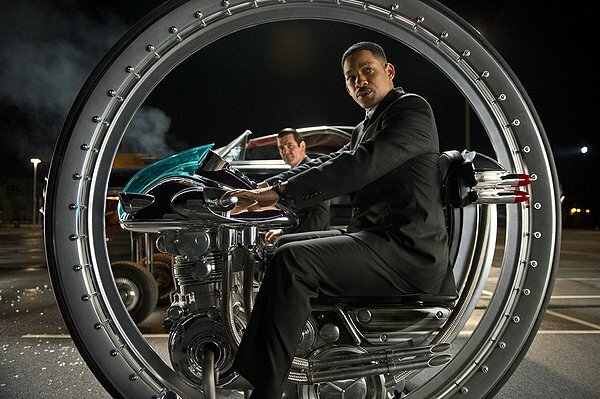 But for the near future, we are likely to see more films like Men in Black 3, where it is the technology, not the filmmaker, controlling the visuals. The film was actually not shot with 3D cameras--it was shot mostly on 35mm, in fact--but Sonnenfeld did have 3D in mind. He tested the native 3D rigs and didn't like them.